If it's not possible for you to send up your Weber turbocharger for a complete rebuild, then purchasing and installing this complete cartridge kit is the next best thing. 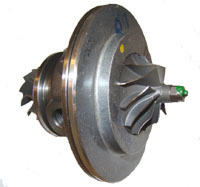 You won't need to balance any turbine wheels or perform any complicate machine work, but you need to verify that your impeller housing isn't warped, worn or damaged. The Weber Off-Road & Snowmobile cartridge assembly is an original part, and is a direct replacement for the turbocharger used in the Polaris snowmobile, UTV applications & most units with the off-road exhaust manifold.